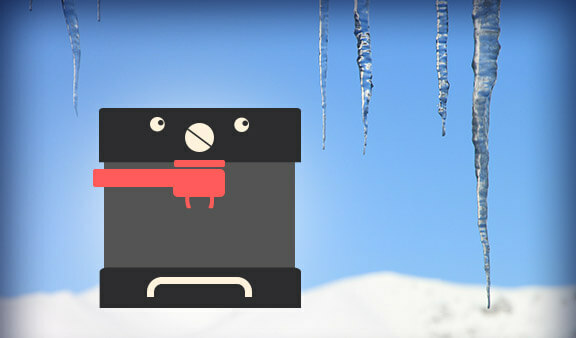 Avoid leaving your coffee machine in a place where the temperature is below 0°C / 273.15K / 32°F, because it might get damaged. You have probably noticed that winters are getting colder and colder and you probably think that only a few more layers of clothing is all you need to adjust to the changing weather. Well, that might be true regarding your personal comfort, but is that really all you need to think about? You might know that 0°C / 273.15K / 32°F is the freezing point of water, but because you weren’t used to temperatures below this value, you might not naturally think of the possibility of frost damage. This isn’t only limited to plants, garden faucets, irrigation systems and cars, it also includes every machinery operating with water, like your coffee maker. Make sure you don’t leave them in places where there is a possibility of the temperature dropping under the freezing point of water. This also includes the transportation of such items. For example don’t leave your coffee maker in the car overnight or if possible don’t post it if you know it’s going to sit in a hangar over the weekend, waiting to be delivered next week. You might not think it’s a real threat, but expanding ice has an immense power. Enough to crack metal boilers in half and causing leaking issues that might end up damaging electric components as well.